No matter where you live, a lease is generally considered a binding legal contract. If it has a fixed term, that means you’re expected to remain in the unit until the end of the contract. But in Indiana, there are circumstances where you can get out early, possibly even without cause. If you break a lease in Indiana, the landlord can require that you pay rent for the remainder of the term. However, due to the state’s requirement that landlords mitigate damages, your landlord is expected to try to find a replacement as soon as possible to let you off the hook. The amount of rent the landlord gets from the new tenant should be deducted from what you owe. In the case of active military duty, you must be a uniformed services member. Once you get the notice, your lease will automatically terminate 30 days after your next rent payment due date. You’re expected to give your landlord notice in writing that you are terminating your lease for military reasons. If your landlord is unable to find a renter right away, you may have to continue paying rent. He may also keep your security deposit to take care of some of that rent. If you fail to pay and your security deposit doesn’t cover the full amount, your landlord could take you to court to get the money. Although landlords have the legal right to continue to collect rent, they aren’t required to by law. You could appeal to the soft side of your landlord by providing as much advance notice as possible of your need to leave, as well as giving the reason. If it’s compelling enough, your landlord may go easy on you. You could also cut down on the time you’ll owe rent by helping with the tenant search, especially if you have a large network of friends likely to be looking for a rental in the area. If you think your landlord will be unlikely to find a replacement renter quickly, you could offer a lease buyout. This means you hand over a lump-sum payment in exchange for getting out of your lease. If your landlord agrees to this, make sure the terms of the agreement are in writing and signed by both parties. Before you break your lease, you should read through it thoroughly. In some cases, landlords include writing in the lease as part of Indiana landlord tenant law on evictions. The agreement may say that either party can break the lease at any time with a certain notice timeframe and a penalty fee to cover the cost of finding new tenants. This wording is put in place to give the landlord some leeway in evicting you if it becomes necessary. If your landlord is the one who chooses to break the lease, there are certain steps she’ll be required to take. In Indiana, your landlord must give 10 days’ notice if you haven’t paid your rent, at which point she can file to evict you. For tenants on a one-year lease, the landlord must issue at least three months’ notice if evicting you outside of the end of your lease. If you’re on a month-to-month lease, your landlord will have to give at least 30 days’ notice. Your tenant will have to go to court to evict you if you refuse to move out within the requested time period. As a tenant, you do have rights under Indiana lease laws. Although your landlord does have the right to evict you in certain circumstances, he cannot discriminate on the basis of race, religion, gender, familial status or handicap. Landlords do have the right to set pet restrictions and enforce them, but if you have a service dog, you’re protected under the Americans with Disabilities Act. If you have an emotional support animal, you’re protected under the Fair Housing Act. The state also protects tenants against surprise rent increases. Unless the rental agreement states otherwise, your landlord must provide at least 30 days’ notice that your rent is going up. Your landlord also must provide reasonable notice before entering your unit. If you’re breaking a lease in Indiana, your landlord is only concerned with whether the rent will be paid. That means if you have a roommate, you may be able to get out, provided your roommate will take over the lease. It also frees you up to find someone to take your place, although you’ll still need to clear it with your landlord if you’re moving out and someone else is moving in. Legally, when you signed a lease with your roommate, you did so jointly and severally. This means that you have a contract with your landlord just as your roommate does. However, if you have a blowup or one of you needs to move out, your landlord will still expect that rent payment every month. That means the remaining roommate will have to find a way to pay the full rent. If you’re the departing person and you don’t help out with this somehow, your former roommate may sue you in small claims court for reneging on your contract. If instead, you’re breaking your release due to a divorce, your “marital residence” will be part of negotiations. A lease is considered part of marital property and subject to division along with all other marital assets. If one of you has decided to remain in the apartment, the court can award it to that person, but that’s where things get a little complicated. When the lease is in the departing spouse’s name, the landlord could dig in her heels on who stays in the apartment. Be prepared to present the court order awarding the spouse the rental unit, a signed agreement between both spouses transferring the lease and a hold harmless agreement that states that the person remaining in the unit will take on all responsibility for damages. Breaking a lease in Indiana can leave you owing money and losing your security deposit. One consequence is that you may find it hurts your credit to bow out of your contract. 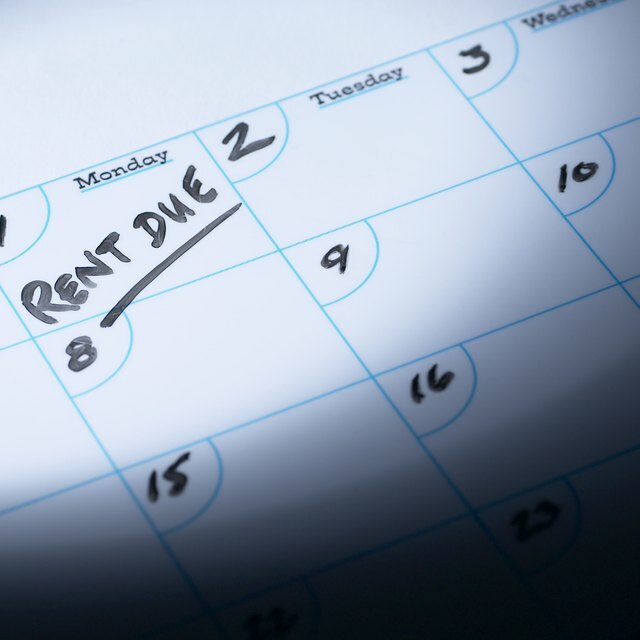 Although your rental payments aren’t reported to credit bureaus, your failure to pay your rent after moving out could end up at a collections agency. At that point, the collections agency could report the issue to credit bureaus, hurting your score. Many landlords will take the matter to court, though, which will possibly result in a judgment against you. All judgments become public record and therefore have the potential to damage your credit. This mistake could hurt you for seven years, preventing you from buying a home, renting a home or making major purchases like vehicles. Perhaps the biggest risk of ending your lease early isn’t what will happen under Indiana lease laws, but how it will affect your future housing options. When you apply for another rental, you’ll be asked to list the places you live. If potential landlords contact the person whose lease you broke, chances are you won’t get a glowing recommendation as a tenant. Instead of renting, you could purchase a place, but you may be blocked there, as well. Lenders will pull your credit report and take your score very seriously. Although breaking the lease itself won’t hurt you here, you’ll want to make sure you pay everything you owe to avoid going to collections or getting a legal judgment against you if homeownership is in your future. If you plan to move out at the end of your lease, you’ll still need to let your landlord know. Under Indiana lease laws, you must give at least three months’ notice if you’re moving out at the end of your term. If you’re on a month-to-month lease, you’ll merely need to give 30 days’ notice that you’re leaving. Most landlords will require you to put down a security deposit when you initially sign your lease. Indiana law requires that landlords return that deposit within 45 days of the date you surrender the property. Ideally, you’ll join your landlord on the final walk-through and agree on any damages. It is your landlord’s right to hold some or all of your security deposit to pay for these things, but you can protect yourself by taking photographs of the unit at move-in and move-out. The Indiana landlord tenant law on evictions also protects renters. If your landlord is not providing a habitable unit, you may be able to get out of your lease early. This is especially true if the property isn’t up to current codes. You should request repairs in writing, along with a reasonable amount of time to fix it, and take legal action if this doesn’t happen. As with many states, you have protections if your landlord is harassing you. He cannot randomly enter your unit without notice or threaten you with bodily harm. He also can’t change the locks while you’re away or shut off utilities to get you to leave. If these events are taking place, document each instance and try to work things out with the landlord or, if applicable, the owner of the property before taking legal action. If you feel unsafe, you should contact law enforcement. An unexpected job loss can leave you in a rough situation when it comes to honoring commitments like leases. Chances are, your lease doesn’t include a provision for financial hardship, but that doesn’t mean you can’t talk to your landlord about it. If you will have no money to pay your rent in a couple of weeks, your landlord will probably prefer advance notice to chasing you down for the payment. Before alerting your landlord to the situation, take a look at the amount of time left on the lease. If you know of someone who could take over the lease, it might be worth lining that person up before you approach your landlord to request termination. You may instead be able to negotiate reduced payments, especially if you’re fairly certain you’ll be able to find another job within a couple of months. Equifax: How Long Does Information Stay on My Equifax Credit Report? Housing4Hoosiers: What Are Tenant Rights in Indiana? Rentec Direct: Is Your Landlord Harassing You?